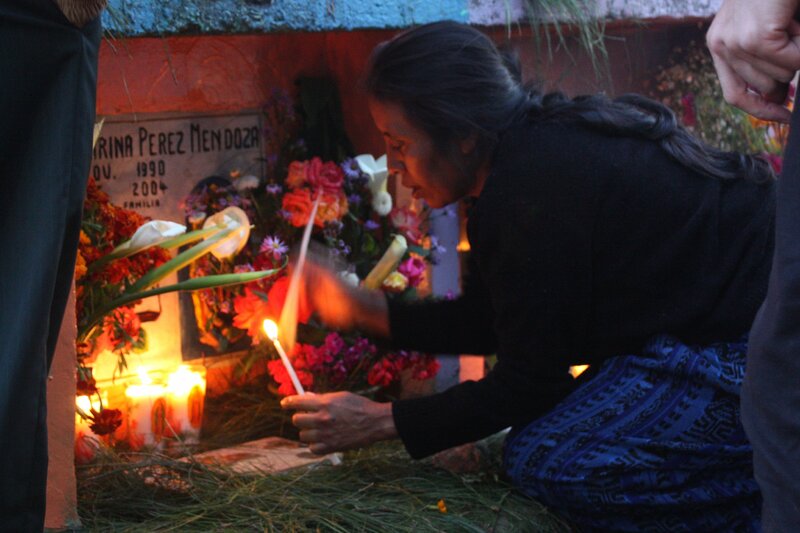 We arrive at the entrance to the cemetery with Graciela and Telma at 8pm and are met by throngs of locals chatting, laughing and making their way around the gravesites in small factions. A marimba band is plugged into an enormous set of speakers and their music fills the night air, children run over and around gravesites with happy abandon- the mood is jovial. The day has been spent tenderly reviving each gravesite. Family members lovingly repaint niches and cement crosses in bright colours and turn fresh mounds of soil, caring for each precious rectangle of earth as though their loved ones had passed only yesterday. As irony would have it we stopped to take in the site of an elderly woman who had passed only fifteen days ago and another where a father and his very young son lay beside each other, their deaths only months apart. I was interested to find that we would stop at the gravesites of complete strangers as well, which was something everyone else seemed to be doing too. This was a time to honour all of the dead and not simply ones own. Each mound of soil is carpeted with a glossy layer of fresh pine needles, deep green in colour and more is tossed down throughout the night. Leafy wreaths punctuated with brilliant flowers hang from crosses that bear the names of loved ones. Chris being the tallest in this cemetery and likely in San Juan too, helps a little local woman to hang a wreath from a third tier grave. We weave our way through a maze of crosses and candles, stopping with the family (now joined by a large number of Diego’s relatives) to pay respect to an endless list of deceased grandparents, uncles, aunts, cousins, fathers and mothers, brothers, sisters, generations of deeply loved relatives being honoured here and invited back on this sacred night of the dead. Slowly we are making our way to the top end of the cemetery to the stacked concrete gravesites. On our way we pass a mariachi band that has gathered at one of the graves surrounded by family and friends. We enter into a lane no wider than a meter and tightly packed with locals. It is built up four or five levels high on either side with stacked concrete recesses, the one at our feet belongs to Graciela’s daughter who died at fourteen years old. 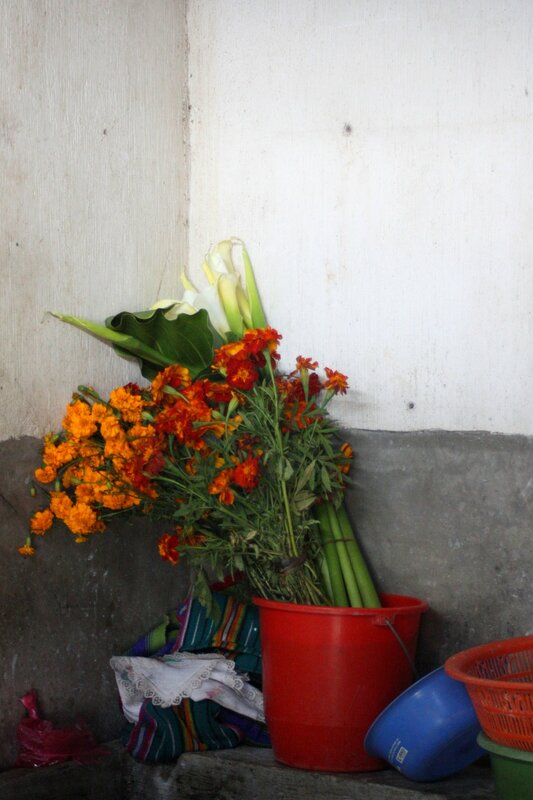 She has prepared buckets of fresh blooms, flor de muertos in piercing shades of orange and red and white calla lilies which now adorn the freshly repainted niche. Glass votives throw off a warm glow in the shadows and little orange candles are carefully stuck down and lit by Graciela. She takes the clay copal burner from Chris who has been carrying it and drops a few more opaque pellets of copal onto the blistering hot coals. Heavily scented smoke instantly bellows out surrounding us in a cloud of sweet perfume, I inhale its aroma feeling that i cannot get enough of it. 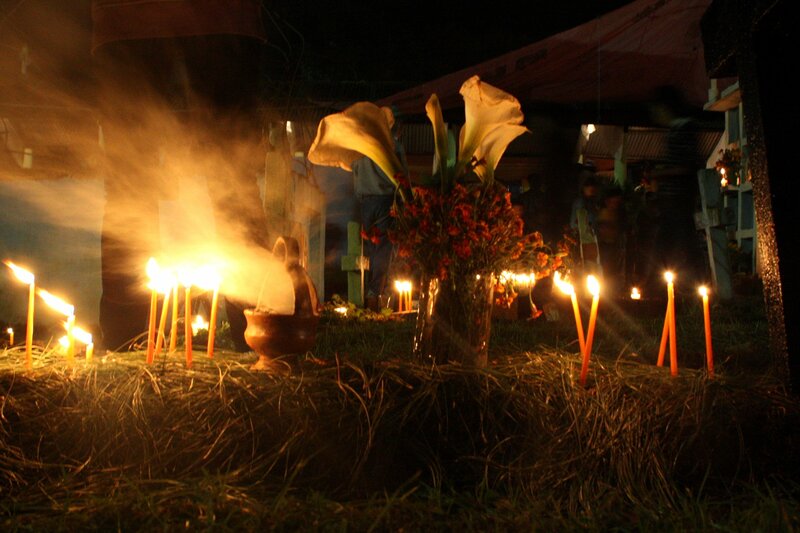 She swings the burner back and forth leaving trails of white smoke which hang in the cold night air before setting it down alongside the candles and flowers. So compelling is this private ritual for a loved one who is no longer, Chris and i silently observe her prayers and blessings from behind, blessed to be included in this never-to-be-repeated slice in time. Graciela at her daughters grave. 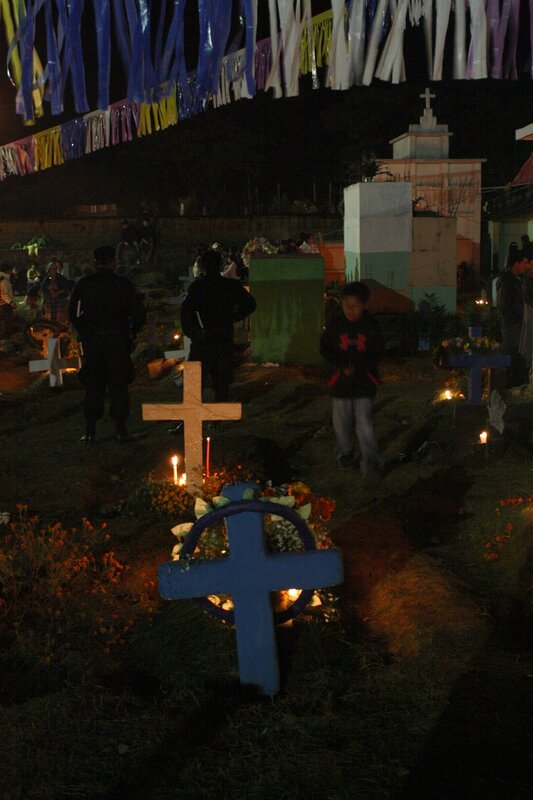 Time marches on, the cold night air sets into the cemetery as Todos Santos (All Saints day) gives way to El Dia de los Muertos. Tonight has brought a deeper level of understanding not only for our family but for the time-honoured tradition of El Dia de los Muertos, celebrating the lives of those who have passed and cherishing the memories they leave behind. The cemetery is alive with love and happiness. We depart at 11pm, returning again at 4:40am the following day and 4pm one last time. Our time with this family has come to a close and we are deeply sad to say our goodbyes. Graciela walked us to our chicken bus and, in a flurry of activity we were gone from their lives. I waved back at her from the bus window with tears in my eyes and off we drove up, up and away from Lago Atitlan. I will never forget her smile or Diego’s enthusiastic ¨waaaaaaaaaaaaooooooow¨ in English with a very ‘wow’ head roll to boot. The smell of wood smoke and the rhythmic clap-clapping of hands shaping tortillas will forever take me back to this magical time in our lives and this wonderful family who gave so much to us. For a moment we weren’t the alien foreigners looking in on life but a part of life with a Mayan family in Guatemala. I would do it again in a heartbeat but i fear we may not be so lucky next time. Gallery | This entry was posted in Global Nomads, Guatemala and tagged Dia de los Muertos, guatemala, homestay, lago atitlan, San Juan la Laguna. Bookmark the permalink. What a wonderful piece you wrote Mila….. and an amazing experience. Thank you for sharing it. We look forward to seeing you and Chris in the new year….. trust you are both well and happy! Hi Su. Thanks very much for that lovely compliment. Our time with that family was a completely different kind of traveling that i will never forget! Today we are at the Chichicastenango market….very very exciting..i need lots more money and an enormous empty bag! We will be back around March and look forward to seeing all of you again too! this is so beautifullyand poinantly written- i was drawn into the moment and felt all the sadness and colour .What a joy to be part of such sorrow.